Welcome to the Math Salamanders' Rounding Numbers hub page. 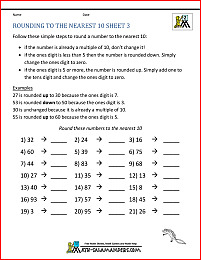 Here you will find links to a range of different rounding worksheets which will help your child to understand about rounding different numbers and quantities. As well as a great selection of rounding number worksheets, we also have an online rounding zone where you can practice your skills online! Are you needing to round numbers to the nearest 10,100 or 1000? Look at the ones digit. if it is 5 or more then round the number up by adding one on to the tens digit and changing the ones digit to zero. 37 rounds up to 40 because the ones digit is 7. 63 rounds down to 60 because the ones digit is 3. 145 rounds up to 150 because the ones digit is a 5. Look at the tens digit. if it is 5 or more then round the number up by adding one on to the hundreds digit and changing the tens and ones digit to zero. 287 rounds up to 300 because the tens digit is 8. 1629 rounds down to 1600 because the tens digit is 2. 950 rounds up to 1000 because the tens digit is a 5. Look at the hundreds digit. if it is 5 or more then round the number up by adding one on to the thousands digit and changing the hundreds, tens and ones digits to zero. 4687 rounds up to 5000 because the hundreds digit is 6. 8296 rounds down to 8000 because the hundreds digit is 2. 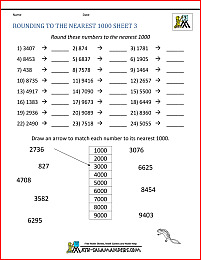 11583 rounds up to 12000 because the hundreds digit is a 5. 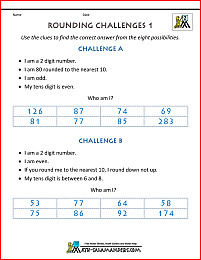 Here is our rounding challenges collection which will give your child an opportunity to apply their rounding learning. The challenges can be tackled individually or with a partner. Each challenge involves using rounding knowledge and properties of numbers to work out the correct answer. develop their understanding about place value and properties of numbers. All the rounding challenges support elementary math benchmarks. 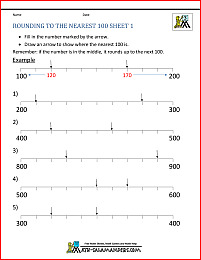 When you are rounding decimals, you will either be rounding to the nearest whole number, or you will be rounding to a given number of decimal places or significant figures. Help with each of these options and examples is given below. When you are rounding a number to the nearest whole number, you are trying to find out which whole number (or integer) your number is closest to. Look at the tenths digit (the digit after the decimal point). if it is 5 or more then round the number up by adding one on to the ones digit and removing the decimal part of the number. 3.8 rounds up to 4 because the tenths digit is an 8. 6.29 rounds down to 6 because the tenths digit is a 2. 12.527 rounds up to 13 because the tenths digit is a 5. When you are rounding a number to the nearest tenth, you are trying to reduce your decimal to the closest decimal with just one decimal place. Look at the hundredths digit (the digit after the tenths digit). if it is 5 or more then round the number up by adding one on to the tenths digit and removing the rest of the decimal part of the number. 1.76 rounds up to 1.8 because the hundredths digit is a 6. 8.746 rounds down to 8.7 because the hundredths digit is a 4. 14.252 rounds up to 14.3 because the hundredths digit is a 5. When you are rounding a number to 2 decimal places, you are trying to reduce your decimal to the closest decimal with 2 decimal places. Look at the 3rd decimal digit (the digit after the hundredths digit). if it is 5 or more then round the number up by adding one on to the hundredths digit and removing the rest of the decimal part of the number after this. 3.729 rounds up to 3.73 because the 3rd decimal digit is a 9. 18.1827 rounds down to 18.18 because the 3rd decimal digit is a 2. 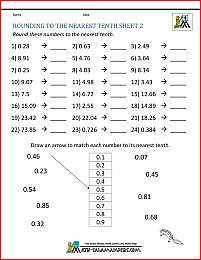 27.625 rounds up to 27.63 because the 3rd decimal digit is a 5. 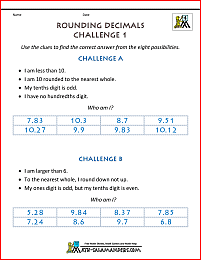 Here is our rounding decimal challenges collection which will give your child an opportunity to apply their decimal rounding learning. Rounding to significant figures is different from rounding to decimal places. The first significant figure is the first non-zero digit a number has. The second significant figure is the digit after the 1st significant figure. The third significant figure is the digit after the 2nd significant figure, and so on. 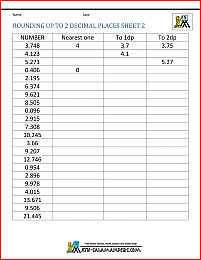 See below for help to round a number to a set number of significant figures. When you are rounding a number to 1 significant figures, you are trying to reduce the number to a single digit and zeros (and possibly a decimal point) to indicate its place value. Look at the 2nd significant digit that the number has. In a decimal, the first significant digit is the first non-zero digit. The 2nd significant digit is the digit after the first. if it is 5 or more then round the number up by adding one on to the 1st digit and removing the rest of the number and filling in with zeros. 8726 rounds up to 9000, because the 2nd significant digit is a 7. 73.283 rounds down to 70 because the 2nd significant digit is a 3. 152 rounds up to 200 because the 2nd significant digit is a 5. 0.003826 rounds up to 0.004 because the 2nd significant digit is an 8. 0.60828 rounds down to 0.6 because the 2nd significant digit is a 0. When you are rounding a number to 2 significant figures, you are trying to reduce the number to a two digits and zeros (and possibly a decimal point) to indicate its place value. Look at the 3rd significant digit that the number has. This is the digit which is two digits after the most significant digit. if it is 5 or more then round the number up by adding one on to the 2nd significant digit and removing the rest of the number and filling in with zeros. 5271 rounds up to 5300, because the 3rd significant digit is a 7. 73.483 rounds down to 73 because the 3rd significant digit is a 4. 175 rounds up to 180 because the 3rd significant digit is a 5. 0.003826 rounds down to 0.0038 because the 3rd significant digit is a 2. 0.60828 rounds up to 0.61 because the 3rd significant digit is an 8. When you are rounding a number to 3 significant figures, you are trying to reduce the number to a 3 digits and zeros (and possibly a decimal point) to indicate its place value. Look at the 4th significant digit that the number has. if it is 5 or more then round the number up by adding one on to the 3rd significant digit and removing the rest of the number and filling in with zeros. 5261 rounds down to 5260, because the 4th significant digit is a 1. 73.285 rounds up to 73.3 because the 4th significant digit is an 8. 1805 rounds up to 1810 because the 4th significant digit is a 5. 0.003826 rounds up to 0.00383 because the 4th significant digit is a 6. 0.07284 rounds down to 0.0728 because the 4th significant digit is a 4.